Editor’s note: This story is reprinted from the November issue of GCU Magazine. To view the digital version of the magazine, click here. Ethan Gunnerson admits he’s a shy guy. 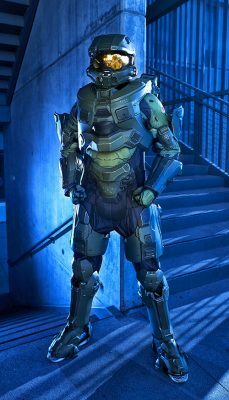 It took several walks past the old “gamer chamber” in Thunder Alley – a room stocked with desktop computers, gaming chairs and consoles – before he felt comfortable enough to go inside. But once he did, his life changed forever. What he and other Grand Canyon University students have now, with their new facility on the second floor of the Technology Building, reflects a trend that is skyrocketing with every click of the mouse. It’s called esports, and it’s coming. In fact, it’s already here. According to a story in Forbes magazine last February, esports revenues will hit $905 million in 2018, up 38 percent from last year’s $655 million. Think that’s impressive? The number is expected to grow to $1.65 billion by 2021. 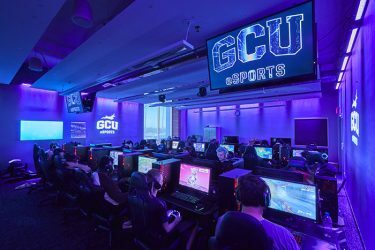 “The esports industry is poised to make far more money than what Hollywood makes at this rate, within like the next few years,” said Albert Lee, the newly hired GCU Esports Coordinator and a former esports consultant for the NCAA. Esports is competitive video gaming, a means of connecting gamers across the globe who play for tournament wins – who entertain millions of people watching from their home wifi or arena seat. The phenomenon is nothing new, but in the past couple of years it has burst onto the scene of big-money competitions, sparking the growth of professional leagues, sponsorships and college arenas that fuel the craze. A group of GCU students saw the trend coming four years ago and started a club. It began with a few of them meeting in a room with their laptops, and before long the University gave them the “gamer chamber” space. 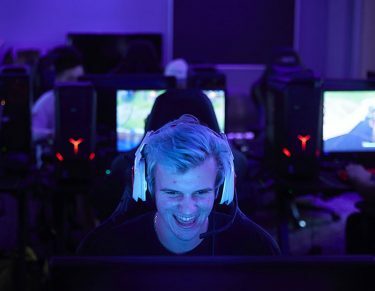 It was nothing like their new home, the 1,706-square-foot room that features 36 computer-gaming stations, seven PlayStation 4 and Xbox One consoles, and a tournament station with a 75-inch TV. 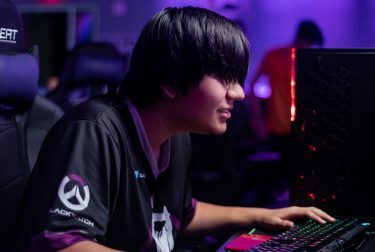 The club sent its Thunder Alley facility out with a bang over the summer with a first-place finish in a tournament for Overwatch, a game that requires six players to synchronize their characters’ skill sets to take down the opposing team. The win came on the heels of their Sweet 16 appearance last year in the college granddaddy of them all, the Tespa League Playoffs, in which the winners among 220 teams take home thousands of dollars in scholarship money. Lee explained that most of the major video game tech developers have headquarters in California, giving an advantage to the universities nearby. Among the examples is the University of California, Irvine being down the road from a wizard in the esports scene, Blizzard Entertainment. “We have to make do with the alternative, which is just we have to be better and more professional and more welcoming to our communities in order to compete at the same level,” Lee said. Blizzard developed one of the firs captivating online games in 1998, called StarCraft. Since then, Blizzard has been on the scene with World of Warcraft, Hearthstone, Overwatch and more. Lee said the fascination with Overwatch is that it was developed to mimic traditional sports. It takes a team to play. According to esportsearnings.com, the nine wealthiest professional gamers in the world have earned more than $3 million each playing video games. Lee said the money goes behind the scenes of tournament wins, too, with companies such as Atlanta-based Cox Enterprises dumping millions of dollars into professional teams for Overwatch. Reports by the Atlanta Business Chronicle backed up Lee’s claim. Gunnerson remembers the days when the club was a gathering — a simple means of hanging out with like-minded individuals. It still is that, but is also so much more now that the door has been opened to money- making expansion. Members of the club compete in multiple sports, not just Overwatch. Other notable games are Hearthstone, Rocket League and a flourishing Fortnite scene. There are more than 600 students in the club’s online chat group. At least 50 students make their way daily through the club’s arena. Ryan Wynia, a sophomore information technology major who is working a cybersecurity internship with the Salt River Project, is primed to carry the club into the future alongside other underclassmen.